Hyde Park is going all out for Halloween this year with lots of free events for kids. HYDE PARK — With Halloween on Monday this year, folks along the south lakefront will get all weekend to celebrate — and there are a lot of options. From scary movies to kids games and of course trick-or-treating, there are options for just about everyone in Hyde Park, Kenwood and South Shore this Halloween and it all kicks off on Saturday. Hyde Park businesses will be passing out candy on Saturday for kids who can’t wait until Monday to trick-or-treat. Participating businesses will have a poster in the window to show they're giving out candy. 4-7:30 p.m., Stony Island Arts Bank, 6760 S. Stony Island Ave. The South Side Home Movie Project will go into its archive of home movies and amateur films to show the best Halloween and spooky footage. The Maxwell family will be there to narrate their own films. “The Incredible Shrinking Man” and “Abbot and Costello Meet Frankenstein” will also be shown. 5-8 p.m., Oriental Institute, 1155 E. 58th St. The Oriental Institute is going all out for Halloween with mummy crafts and games for kids, as well as a mummy story and a chance to get your fortune told from the pyramid fortune teller. The museum is promising to deck out its galleries for the event and will have goodie bags for kids. 6-8 p.m., 57th Street Books, 1301 E. 57th St. The bookstore will host an evening of spooky stories and in-store trick-or-treating, as well as a sickening stew à la "Macbeth." Staff said costumes with a literary reference are appreciated, but not required. 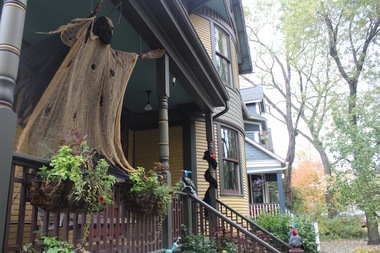 6-9 p.m., Kennicott field house, 4434 S. Lake Park Ave.
Kennicott Park is hosting its annual haunted house as well as a scary movie, treats and other activities for kids age 3 and older. 7 and 9 p.m., Mandel Hall, 1131 E. 57th St. Noon, Promontory, 5311 S. Lake Park Ave.
Public access TV show “Chic-A-Go-Go” will tape its 20th anniversary Halloween dance party. Kids and their parents are encouraged to come in costumes ready to dance. Non-alcoholic drinks will be available for kids at the bar. 7 p.m., Rockefeller Chapel, 5850 S. Woodlawn Ave. The chapel will screen the classic Lon Chaney silent film with live musical accompaniment on the church’s organ and carillon. Washington Park Advisory Council will host a free Halloween party for kids with free food, games and a raffle. 4-6 p.m., Jackson Park field house, 6401 S. Stony Island Ave. The park will host a free Halloween party for kids with games, dancing and face painting. 4-6:30 p.m., Blackstone Public Library, 4904 S. Lake Park Ave.
Blackstone library will host its annual Halloween party with spooky stories, games and crafts for kids of all ages and their families. 6 p.m., Silver Room, 1506 E. 53rd St. The Silver Room will host a performance of “Once Upon a Zombie Apocalypse” by Chicago playwright Ashley Robinson for kids ages 5-10. Treats will be available for kids, who are encouraged to come in costume. 7 p.m., Max Palevsky Cinema in Ida Noyes Hall, 1212 E. 59th St. The university’s movie theater will show a spooky mystery film with complimentary treats for those who come in costume. 8:30 p.m., Promontory, 5311 S. Lake Park Ave.
Renaldo Domino will put on a special Halloween soul-themed performance with Andre “Mr. Rhythm” Williams. Why Is 95th Street Such A Tough Sell In Beverly?